The finished router cabinet - neat and tidy - the way it is going to stay! 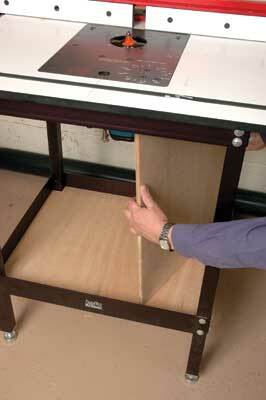 Router tables with built-in lifts are great. At the turn of a handle, they provide fine-height control needed for precision routing. However, there are three problems; the router table spreads dust everywhere, there is nowhere nearby to keep router bits and the powerful motor left running between cuts makes one heck of a noise. But this one simple project has helped to solve all of these. Of course, you can attach the clear plastic dust shroud to the router when it is under the table. While this method does not shift much air at the best of times because of the small size of the vacuum hose connection, it will help matters while the table lift is raised to full height. 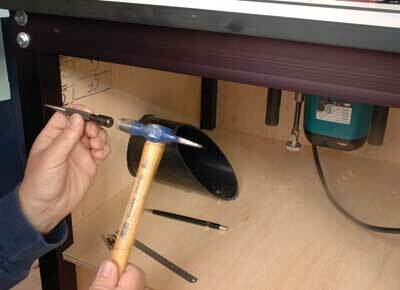 The real problem comes when you lower the lift, creating a gap between router sole and table. Then the shroud becomes practically useless because most of the dust flies out through the gap between the lift and table and then spreads across the floor. Apart from the bother of having to sweep this mess up from between the table legs, I am also troubled by the thought that it propels fine dust through the air, where much of it remains, waiting for an unsuspecting pair of lungs to breathe it in. 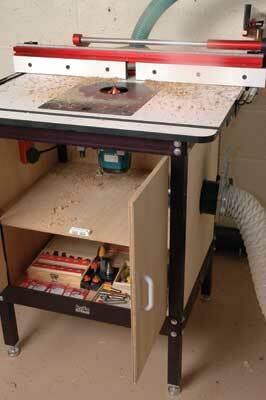 Good router tables can be pricey and I wanted to keep any modifications to mine to the absolute minimum. 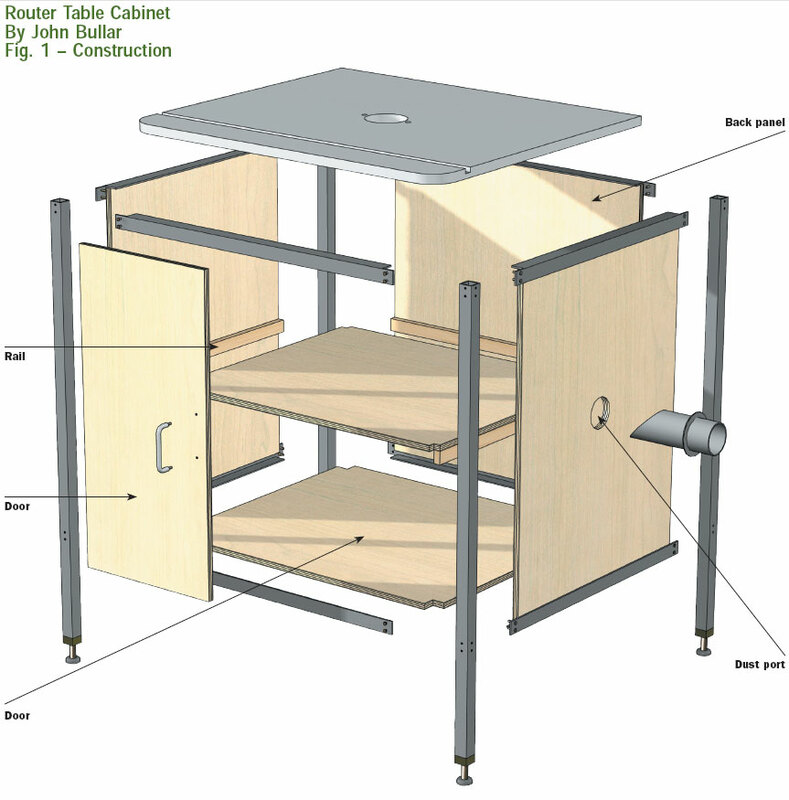 The table I used was a Jessem, but you might wish to apply your ingenuity to adapting this dust and storage cabinet design to fit different makes. In my workshop, I use a high-volume, low-pressure type extractor, the sort with an upper and lower dust bag and a large centrifugal fan in a snail shell casing to shift the air. It is connected via a 100mm (4in) diameter duct system joined to all of the equipment that produces dust. You might adapt the design to different sizes and styles of collector, but the main thing is to ensure that it uses a fine filter because routers can produce some very fine dust. The last thing you want is a collection system that simply launches this dust into the air. The sturdy frame that supports a Jessem table has square section alloy extrusions for legs, braced by L-section rails near the floor and beneath the tabletop. By using the lower rails to support the base, you can fit the sides and rear panels between the legs and inside the rails, pressed firmly in place by the central shelf without needing any glue or screws into the frame, other than those that hold the door hinges. 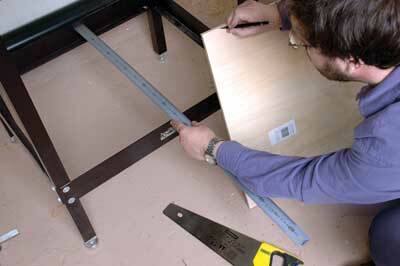 Start by accurately measuring the gaps between the table leg pairs, front and rear and pairs of rails. It is worth making these measurements in a couple of places to ensure the frame is not slightly twisted. Any inaccuracies at this stage will lead to gaps around the panels when they are in place, permitting unwanted leakage into the vacuum extraction system. 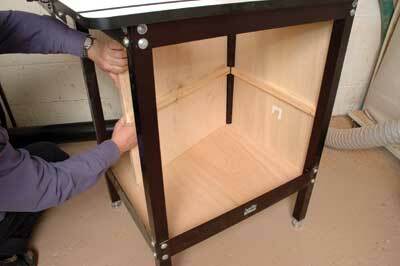 The material used for this cabinet is 12mm- (1/2in) thick marine plywood. This may be thicker than you would expect for a utilitarian piece of equipment, but there are two good reasons for this. Firstly, there is very little springiness to plywood of this thickness, enabling the sides to stand rigidly between the legs without bowing in when the suction is applied. Secondly, it contains the noise - weight and stiffness are two of the main factors that determine how good a partition is for preventing sound transmission. MDF would do the job equally well, although I prefer working with ply. 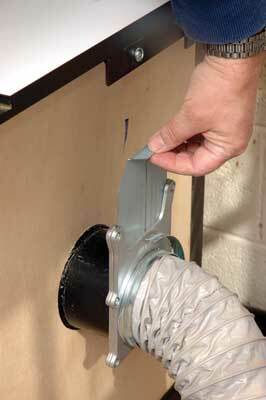 Chipboard is slightly less dense so it would be less effective - it is also very difficult to cut clean edges. Cut the base panel as a rectangle to fit tightly into the frame formed by the lower rails and cut out the corners to fit around the legs. Drop this panel into place allowing you to measure the height from its top surface to the underside of the upper rails. 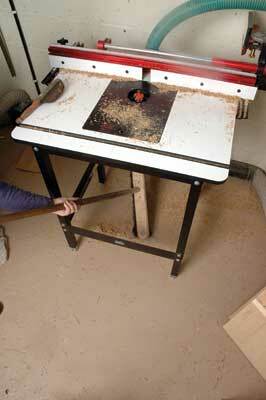 This measurement will form the height of the side and rear panels which are cut as simple rectangles. Test fit the side and rear panels and remove them to fit support ledges for the mid-height shelf. Choose the height of this shelf so that, with the router in its lowest position, there will still be a gap of at least 50mm (2in) between the router base and the shelf top. This will prevent any possibility of obstruction to the router air vents. 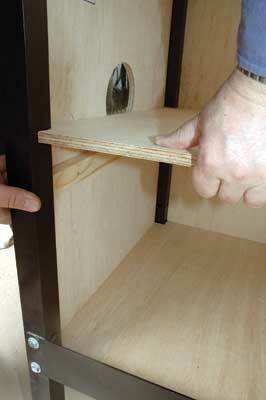 Make the support ledges from 25mm (1in) square section softwood batons and cut to length to match the panel width. Decide which will be the outer face of the plywood - the one with the tidiest surface - and glue the batons across the inner face. 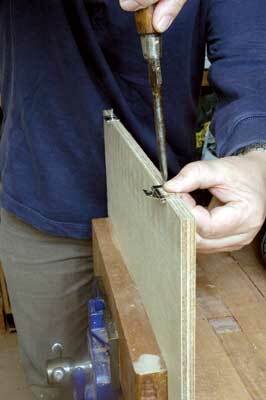 Use clamps or weights to hold them in place while the glue sets. Make the mid-height shelf in the same way as the lower shelf, but this time it has to fit inside the gap between side panels and between the rear panel and doors. This means the main dimensions are 24mm (15/16in) less, and each of the cutouts around the legs is 12mm (1/2in) less. Make the doors from the same 12mm (1/2in) material, cut to length to fit between the edges of the upper and lower rails. The horizontal dimensions need to allow a very small gap at each side around the hinges and a small gap in the middle - aim for around 1mm. Any less than this and the doors will jam, any more and too much air will leak in. 'Easy fit' hinges are quite suitable - the thin steel type designed to fit in a small gap without needing rebates. 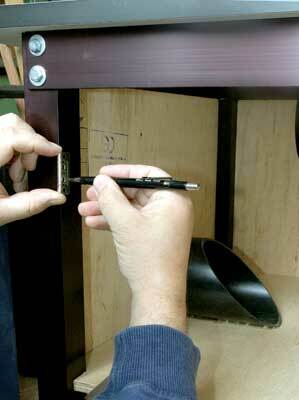 The barrel of the hinge fits in front of the doorframe formed by the table leg. Magnetic catches are the most suitable. 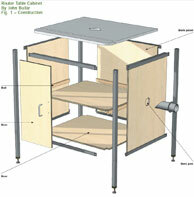 These can be fitted to the edge of the shelf with the steel plate in a corresponding position inside the door. A pair of simple handles completes the doors. Make the dust extraction port from a piece of rigid plastic pipe, choosing the size to match the hose on your collection system. Although the hose on my extractor is a nominal 100mm (4in), I have a tapered push-fit connector on the end. This enables it to fit a variety of nozzles of slightly differing sizes including the 110 mm (4 3/8in) drainpipe which is what I chose to use. The tapered fitting I refer to is not some expensive component - it started life several years ago as a plastic putty tub! Cut a hole through one of the side panels to fit around the extract pipe. 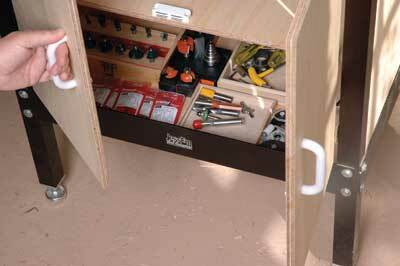 Because the side panels are interchangeable and only held in place by the shelf, it does not matter which panel you cut - you can swap them later to suit your workshop layout. 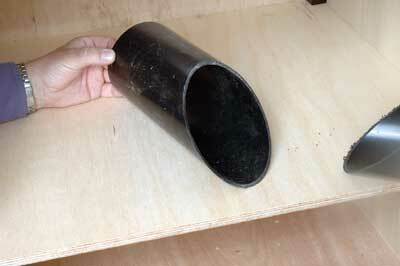 Position the hole with its lower edge level with the shelf top - i.e. 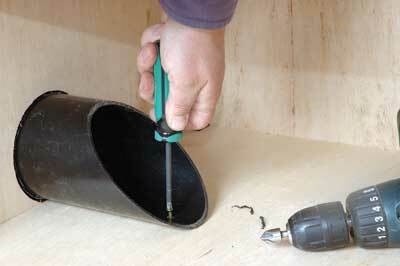 12mm (1/2in) above the baton - it needs to be a good fit around the pipe. 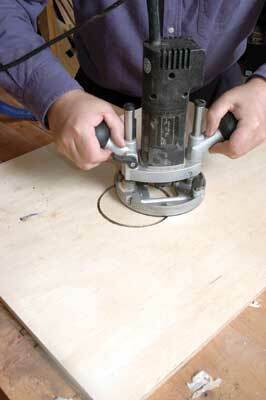 Use a hand-held router with a small straight bit to cut the hole. If you have a trammel arm arrangement, all well and good, but otherwise just use a small hole in the router base at a distance from the outer edge of the cutter which matches the pipe radius. Put a screw or tack through the hole and run the router around it so it cuts a neat circle like a tethered goat in a field. Fit the rear panel and both side panels, including the one with the circular hole. Cut the pipe end off at an angle so it has a large opening - this also allows you to fix the base of the pipe onto the mid-height shelf with a couple of countersunk screws. 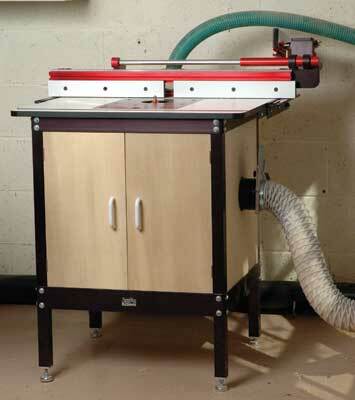 Depending on the size of your workshop, you may wheel the dust extractor between machines or you might want to connect it up permanently. A permanent installation may use more pipe and take longer to initially set up, but will enable you to work more efficiently in the future. The effectiveness of dust extractors can be variable. Apart from the basic parameters of the extractor - namely flow rate and pressure, the efficiency can vary from time to time. The most common cause of this is a blocked filter. Leakage through gaps in the system often causes problems. So does resistance to flow as the pipe is too small, too long or has too many bends. A very useful addition to any extract system shared between a number of machines is the blast gate. It works like a gate valve enabling you to turn the flow on and off when your extractor is connected to a number of machines. This allows the full flow to be taken from any machine, rather than sharing it with others. As a final treat, I gave the panels and the doors a lick of varnish. This is not strictly necessary but it will help keep them clean and free of dust. I have used the cabinet for a few weeksand found that very little dust escapes even after a long run of routing. Connect an extract hose to the rear fence and hardly any dust seems to escape. A bearing-guided bit will cause some dust, but once the router has stopped this can be swept into the opening with the extractor still running. Finally, before switching off the extractor I open the doors and brush any remaining dust from the shelf into the open port. "The effectiveness of dust extractors can be variable"